Despite tax collection increasing by 50 percent in the last 9 years, California’s public pension insolvency is forcing Gov. Jerry Brown to propose a dangerously unpopular 42 percent increase in gasoline taxes and a 141 percent increase in vehicle registration fees. Breitbart News reported on January 9 that Gov. Brown announced that for the first time since 2012, California’s $122.8 billion General Fund Budget is in deficit by $1.6 billion. Despite a near bankruptcy during the financial crisis, California’s tax revenues have increased by about $43 billion in the last 9 years. Brown on Monday only suggested relatively painless spending reductions to close the budget gap. He was very careful to not suggest highly controversial increases in gasoline tax or vehicle fees. Democrat governors have been regularly spiking gas taxes and vehicle registration fees for decades. But 12 years ago, Democrat Gov. Gray Davis was recalled by voters after he pushed the state legislature to pass a vehicle registration fee increase from $46 to $158. The legislature cancelled the increase and Democrats have avoided gas and vehicle increases since. When the Assembly tried to revive a gasoline tax last year, the issue was dropped after polls showed 63 percent voter opposed any increase. Gov. Brown’s willingness to try raising gasoline taxes by 17 cents a gallon, and on vehicle registration fees by $65, is a sign of the insolvency risk from the exploding cost of California Public Employees’ Retirement System (CalPERS) public pensions. Brown’s draft 2017-2018 budget already includes a $524 million increase for the public pension contribution. That amounts to an 11 percent increase over this year’s $5.3 billion cost. The CalPERS contribution increase would have actually been another $516 million more next year, but the world’s biggest pubic pension is allowing the State of California to “smooth” the higher pension funding cost by reducing its projected investment return expectation from 7.5 percent to 7 percent. But that smoothing will lock California into about a $524 million CalPERS contribution increase for each of the next four years. Breitbart News reported in December that Stanford University’s “U.S. Pension Tracker” calculated that if CalPERS used the 2.75 percent interest rate on 20-year U.S. Treasury bonds as a “conservative” expected investment rate of return, the state would have a $964.4 billion unfunded actuarial public pension debt, or about $92,748 per household. But under this conservative scenario, California would be required to start contributing an extra $3 billion to CalPERS immediately. Given that CalPERS only earned a 2.4 percent investment return in 2015, and just 0.61 percent last year, the 2.75 percent expected investment return may actually not be that conservative. Gov. 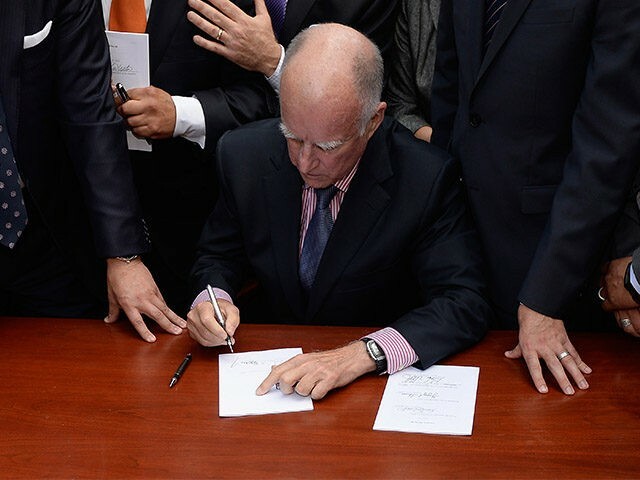 Brown has little flexibility to raise taxes to fund CalPERS, because “Taxifornia” already has the highest personal tax rate of 13.3 percent and its sixth highest corporate rate of 8.84 percent. According to a study by the Pacific Research Institute, the brutally high tax burden has been the cause California’s abnormally slow growth, its net exporting of U.S. citizens and its shrinking labor force for over a decade.